Printed in USA. 16" x 16". Available in 2 options. Pillow (Cover Only) or Pillow (Cover With Insert). 100% spun polyester poplin fabric. Individually cut and sewn by hand. A single sided print with white back. Finished with a concealed zipper. Manatee Im With Stupid Commercial Novelty Pillow Cover for Couch Sofa. Printed in USA. 16" x 16". Available in 2 options. Pillow (Cover Only) or Pillow (Cover With Insert). 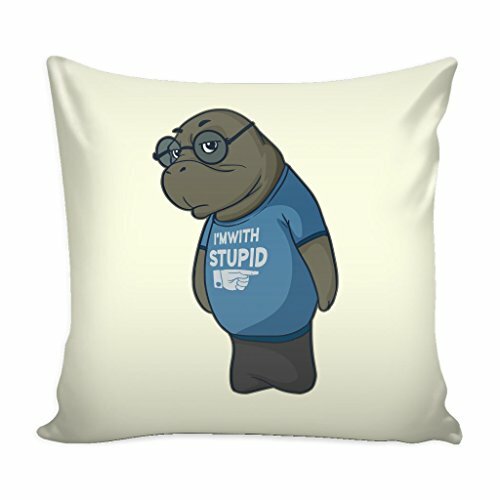 Funny Im With Stupid Meme Manatee Pillow Cover for Men Women Kids. Manatee Decorative Pillow Cover for Men Women Kids. Manatees Im With Stupid Pillow Cover. Cute Sea Cow Graphic Pillow Cover. Great gifts for Birthday, Valentine's Day, Mother's Day, Father's Day, Easter, Wedding Anniversary, Graduation, Back to School, Surgery, New Parents, Engagement, St. Patrick's Day, Halloween, Thanksgiving, Hanukkah and Christmas. Awesome Novelty Birthday Gift Printed Pillow Covers for Couch Sofa Kitchen and Living Room. Pillow cover gifts for Men Women Boys Girls Kids Dad Mom Grandma Grandpa Uncle Aunt. These awesome custom made one of a kind adult and kids pillow covers are not mass produced. These birthday gift or Christmas gift throw pillow cover are made to order. If you have any questions about this product by Manatee, contact us by completing and submitting the form below. If you are looking for a specif part number, please include it with your message.